Testgiving is a special night, Jimmy Walker used to say “DYN-O-MITE”! Thank you Adam Sandler for letting us take liberties with the lyrics to your Thanksgiving song. We have a tradition in our household. It’s fairly new, but hey, a tradition has to start somewhere, right? The past few years we’ve participated in something we call “Testgiving”. Three or 4 weeks prior to the big day we do a practice run to try out new recipes and get the menu nailed down. It gives us an idea of what works and what needs to be chucked, how long the dishes will take to prepare, and who gets kitchen priority. Sure, it’s a A LOT of work and some would label us culinary masochists, but it’s fun, the food is always delicious and we get to celebrate twice. What’s not to love? This past weekend, we celebrated our 4th annual Testgiving event and I must say, it was a great success. Previous practice runs always include participation from the usual suspects at our dinner gatherings…my sister Patricia, her boyfriend Sean, and of course, Kirk and moi. This year we decided to expand our guest list just a wee bit and invited our friends Debbie and Alex to dine with us as well. Sometimes it’s good to get some outside input. Whew! That’s a helluva menu! AND let me emphasize that short of catching our own turkey and grinding our own flour, this entire meal was as close to scratch as you can possibly get. Okay, with the exception of one shortcut confession…the triple corn spoon bread calls for canned whole kernel corn, canned cream corn, and a box of corn muffin mix. This particular dish has been a Turkey Day standard fave for years and will not be going away anytime soon, so why fight it. This week we’ll be sharing several of these recipes with you, in hopes that you might consider adding them to your own T-Day lineup. Today I’m starting with a couple of dishes that you might be inclined to reach for a can opener to prepare, but let’s not. One is ridiculously easy and the other requires a bit more effort, but is oh so worth it. The first is a small, but mighty contributor to the big meal. 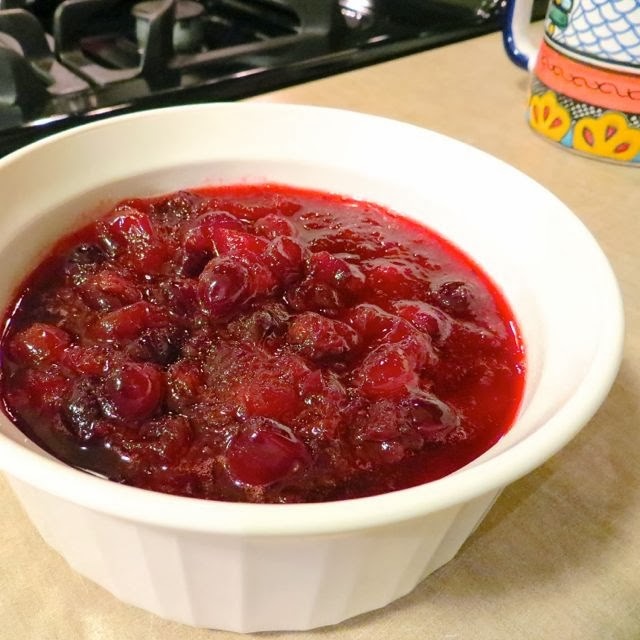 You wouldn’t dream of celebrating without it…the one and only…Cranberry Sauce! The second is a holiday staple and a fan fave, but once you taste the real deal, you’ll break up with that Campbell soup version FOREVER…Green Bean Casserole. Our friend, Alex, is an anti-vegite…don’t even think about garnishing his plate with so much as a teensy sprig of parsley as he will launch into a full-blown veggie hate-crime spree. He tried the green beans and went back for seconds…yep! I turned him! Let’s start with the cranberry sauce. This recipe is right off the Ocean Spray bag and literally takes 10 minutes to make. I’ve added the zest and juice of one orange to give that delicious tart zing a bit of sweet balance. As the berries cook they will start to pop creating a symphony of flavor. Add all of the ingredients into a large sauce pan and cook over medium heat for 5 minutes. 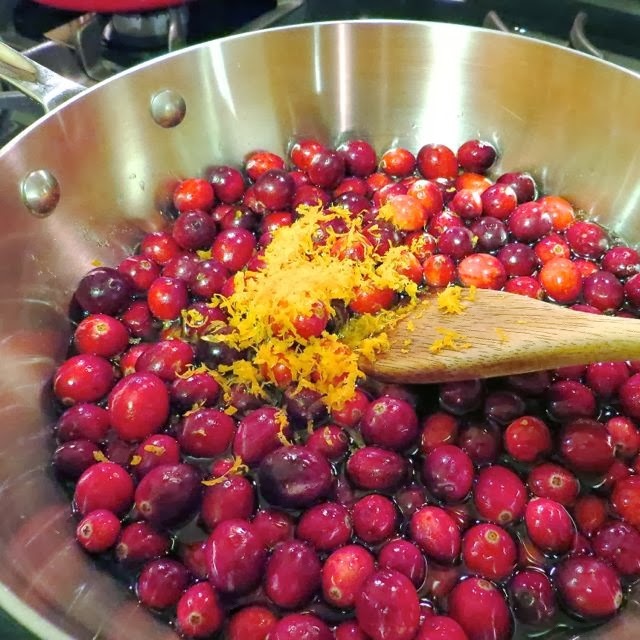 Cranberries will burst and sauce will thicken as it cools. Shoot! It doesn’t get any easier than that! Next up, green bean casserole. I borrowed this recipe straight from Alton Brown, a true believer in doing things the right way. This recipe is no exception. Let me start by referring you to this excellent, but short video of Alton Brown preparing this dish. It’s about 4 minutes long, but covers so much. 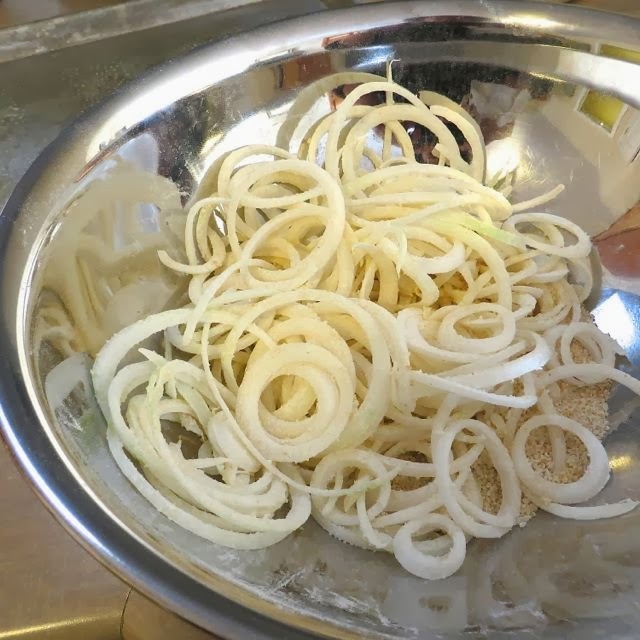 In particular, those onions. Pay close attention. Here’s a link. Combine flour, bread crumbs, and salt for topping in a large bowl. Slice the onions thin with a mandolin and toss them in the flour mixture, coating evenly. 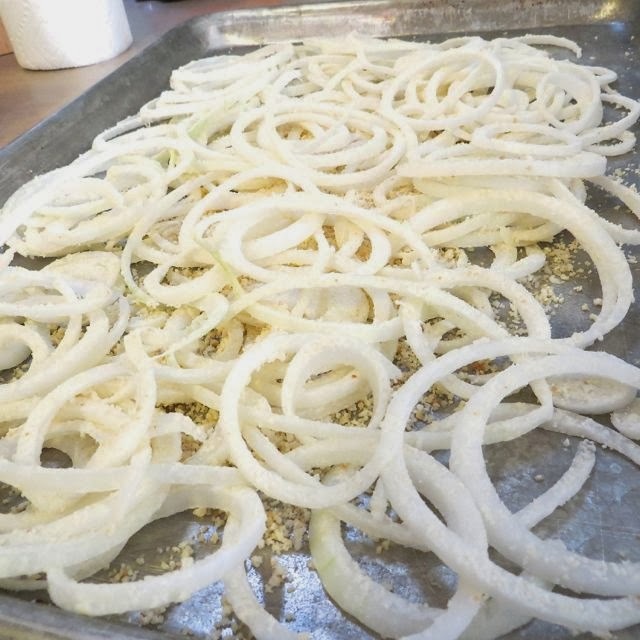 Spray a sheet pan with cooking spray and evenly spread the onions on the pan. Place the pan on the middle rack of the oven and bake for 30 minutes. Toss the onions 2 or 3 times during the baking process. Watch them closely as they will burn quickly if left unattended. When the onions are golden brown, remove from the oven and set aside. Turn the oven down to 400º. Blanche the beans for 5 minutes in a gallon of boiling water with 2 tablespoons of salt added. Drain and add to a large bowl of ice water to stop the cooking process and maintain that bright green color. Drain again and set aside. 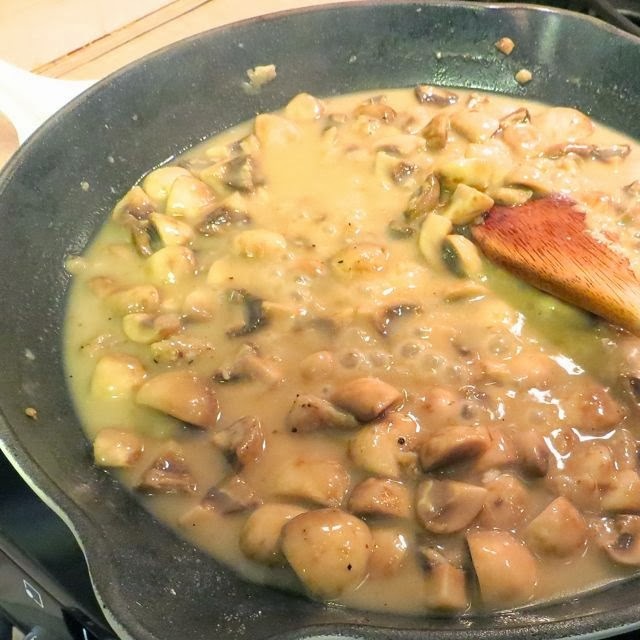 Melt the butter in a 12-inch skillet over medium-high heat and add the mushrooms, 1 teaspoon of salt, and 1/4 teaspoon pepper. Saute for 5 minutes and add the garlic and nutmeg. Cook for another minute or two. Sprinkle the flour over the mixture and stir to thoroughly combine. Cook for a couple of minutes, then add the chicken broth. Cook until the sauce begins to thicken, then drop the heat to medium-low and add the half-and-half. Sauce should thicken after 6-8 minutes. 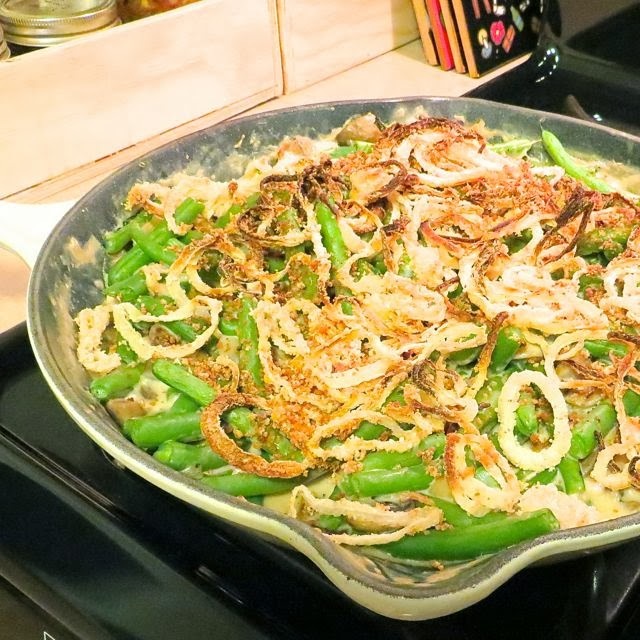 Add the drained green beans to the skillet and 1/4 of the onion mixture. Stir to combine. Top with the remaining onions and bake at 400º for approximately 15 minutes. Watch closely, as the onions will continue to brown. Remove and serve immediately. Pardon my french, but “DAMN” these were good! I’ll be adding these beans to the regular rotation, no holiday needed.